I’ll have more to say over the next couple of days about the latest report on the S&P Case-Shiller Index, but I just want to offer a quick note this morning. The article notes that only one city in Texas — Dallas — is among the twenty used in the index, and that they saw a year-to-year decline in home prices in December 2010. Most of the other indexed cities suffered tremendous declines in prices over the past couple of years, so seeing them recovering is great news — for them and for the country. The price decline in Dallas, however, should not be over-interpreted. The fact is that home values in Texas have remained relatively stable during the recession, so occasional adjustments are not surprising. You can see that the average sale price in December 2010 was slightly below December 2009, but look at the magnitude of the price spike we saw at the end of 2009! A small decline in comparison really isn’t disappointing. INCREASED in twelve of the last thirteen months! That average set another ALL-TIME HIGH in December 2010! 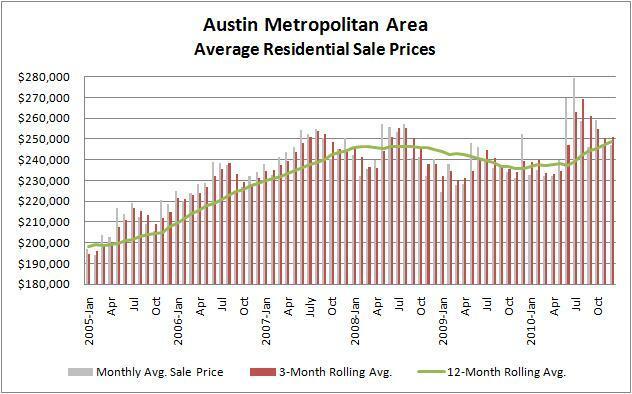 Now that final data for December is in, I will update my Austin Market Dashboard and offer more extensive comments. For now, I just want to congratulate the cities that have suffered most during this recession, and wish them well in 2011. I also want to reassure my readers that Texas and Austin real estate are alive and well, and looking forward to continued improvement this year. I had been feeling we had bottomed out by late 2010, looks like it hit right at the end of summer. Good post, the graph was a plus!